It's the second night of STS9 – Sound Tribe Sector 9's live fall shows at Red Rocks as they return back for another year to bring the crowd a mind blowing show! With their outstanding concerts they bring an effortless display of improvisation right before your eyes! 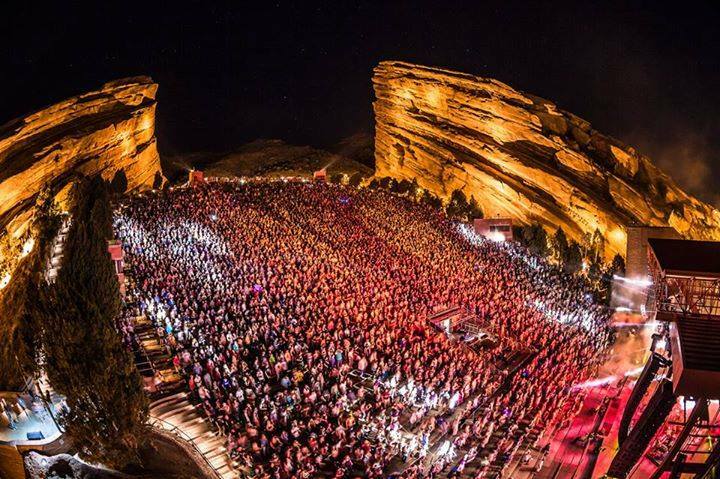 Red Rocks is the perfect place for STS9 to showcase their music as they often have psychedelic lights and visuals to coincide with their performance… come and experience it all on Saturday 7th September 2019 – tickets are already flying for their limited 2019 dates! Sound Tribe Sector Nine (also known as STS9) is an instrumental electronic rock band that was formed in Atlanta, Georgia, in 1998. Fusing typical rock instrumentation with electronics, and with a passion for group improvisation, the band are known for their incredible live performances and extensive touring. They have ranked among Pollstar Magazine’s list of top-grossing touring acts and headline several festivals every year, having notably performed at Bonnaroo, Wakarusa, Electric Forest, and Suwanee Hulaween to name a few. To date, the band has released 11 studio albums, two remix albums, and multiple live DVDs on their independent label 1320 Records!